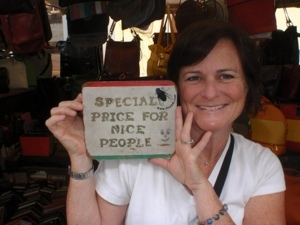 Today’s Joy Dare Challenge is to name three gifts you’ve learned. 323. I am good. 1Timothy4:4 “For everything God created is good, and nothing is to be rejected if it is received with Thanksgiving” (emphasis mine). I wasted 40 something years on not liking myself. I always thought of myself as too loud, too curvy, too messy, too dumb…just not good enough. I saw the beauty in everyone else but me. I guess I’m a slow learner…if I truly believe that God made me and I know that God don’t make no junk…then guess what?! I’m not junk either! 324. I can write a blog. There are millions of blogs out there, some good and some not so good. Anyone can do it, right? “Not me!”, thought I. Then I started hearing this crazy voice in my head encouraging me to start one. Now…understand that I have no clue about computers, programming, defragging, bits and bytes. But looky here….I’m writing a blog! 325. 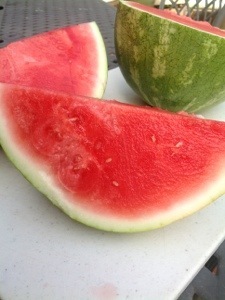 When choosing a watermelon, look for the yellow spot. 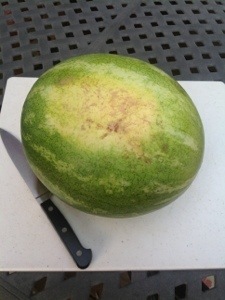 You would think that you would look for a dark green melon, but nooooo says my son! His grandmother taught him to look for the yellow spot. Hmmm….He just might be right! It is red and sweet! It really tickles me to death to read your comments, so why don’t you tell me three things you have learned. Maybe I can learn a few more things from you! I hope you see God today! Wag more and Bark less! Posted on July 17, 2013 by mary •	This entry was posted in joy and tagged Joy Dare, love. Bookmark the permalink.